India is once again drenched in the colors of Pro Kabaddi, as the sixth edition of the league starts from the 7th of October in Chennai, Tamil Nadu. Super fun and exciting, the upcoming three months are going to be spectacular. Twelve teams from every corner of the nation will compete for "the trophy". It will all come down to that final match, which will take place in Mumbai on the 5th of January. Gujarat Fortune Giants is one of the twelve teams, based in Ahmedabad. The team was led by Sukesh Hegde in season 5 and coached by Manpreet Singh. The team is owned by Adani Wilmar Ltd. They play their matches at The Arena in Ahmedabad. Giants made their debut in season 5 and also played the finals against Patna Pirates, which was stellar. Eventually, they lost to the pirates in that match. Gujarat played wonderfully since the beginning of the season. They had a proper balance of both experienced and young. Even the offense and defense of the team was spot on. 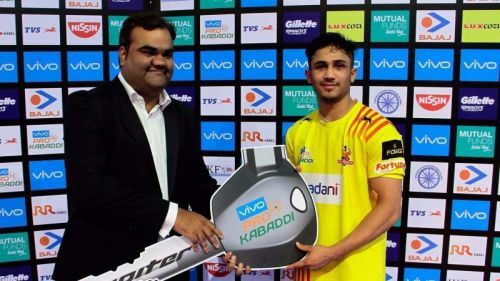 Gujarat declared the young Sunil Kumar as their captain. His performance was excellent last season without a doubt, but leading such a big squad is extremely difficult. Captains go through a lot of pressure throughout the tournament and handing over this responsibility to a player so young can backfire for the team. Players like Mahendra Rajput and Ajay Kumar were great contenders for the captain's position given that they have been playing in the league since really long.